You can adjust Safari settings to keep your browsing activities to yourself and protect yourself from malicious websites. Want to keep a low profile? Turn on Settings > Safari > Do Not Track. Safari will ask websites you visit to not track your browsing, but beware—a website can choose not to honor the request. Control cookies. Go to Settings > Safari > Accept Cookies. To remove cookies already on iPhone, go to Settings > Safari > Clear Cookies and Data. Let Safari create secure passwords and store them for you. 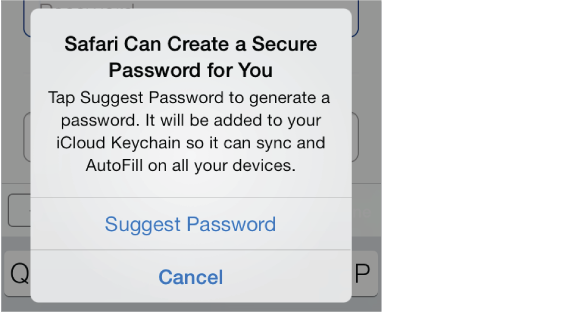 Tap the password field when creating a new account, and Safari will offer to create a password for you. Erase your browsing history and data from iPhone. Go to Settings > Safari > Clear History, and Settings > Safari > Clear Cookies and Data. Visit sites without making history. Tap Private while viewing your open pages or bookmarks. Sites you visit will no longer be added to History on your iPhone. Watch for suspicious websites. Turn on Settings > Safari > Fraudulent Website Warning.